Since this web site has been active I have received many calls for planning assistance. The one area where there seems to be a huge lack of knowledge is in the use of TOPO maps in Garmin portable devices. All Garmin portable aviation devices allow you to manage waypoints and detailed TOPO maps in a Garmin software products called BaseCamp which I use for waypoint and route management and MapInstall to load Garmin maps into portable Garmin devices. When going to Alaska Lakes there is often great confusion on what lake you are over. When you load the 100K TOPO map from Garmin into your portable GPS most of the confusion will be gone. Without this load the lakes do not show up in some devices. You can also load my Garmin waypoints of every cabin which is on a lake. The two pictures below show Young Lake in a Garmin without the detailed topo and with the 100k TOPO information. The first screen is from a 395 through 496 series GPS. The base map in the 795/796 is greatly improved but nowhere near is good as the 100k US TOPO. The documentation is not clear on the 795/796 but I am told there is a map limit of 3200 map segments this is up from 900 in the 396. Buy the TOPO US 100k in DVD format, the Canada DVD for the area you need or both. Then with MapInstall create the map set you need. In some cases you can get 24K topo information, these give 4 times the detail which is great for hiking but not for aviation. Before release 4.0 in the 796 the use of a separate chip for the 100k maps could cause a stability problem. They are now on release 5.01 and buying the 100k topo chip looks like a better solution. Buy the chip, load it, and you have 100k detail for the United States including Alaska. Being safe in Alaska means you have complete situation awareness and you know what the weather is, using the Garmin 100k TOPO maps and my way-points will give you the map situation awareness. I have checked these way-points over numerous years and they are more accurate than the Forest Service but it is your responsibility as PIC to determine they are accurate for your mission. As of December 2015 you can not download my waypoints or 100K maps to Garmin Pilot or ForeFlight. In my iPhone and iPad I use Garmin pilot and a separate program called Gaia GPS for pre-flight study of a lake I am flying into. 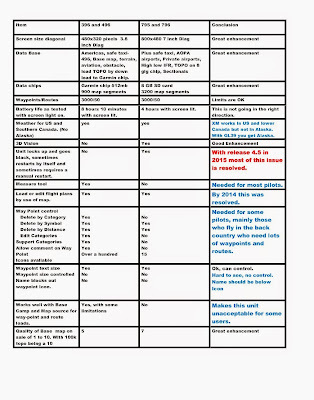 The below chart is the opinion of Tom Bass and other pilots with different flight requirements may have different opinions. The west coast of Canada and the Alaskan coastal areas are extremely dangerous flight environments where the weather can change in a few minutes and the next airport can be 100 miles away. My opinions have been greatly influenced by this environment. Although most pilots will not experience these conditions having a GPS which is loaded with all your routes, has good weather information, and detailed maps is an advantage that can make the difference in whether a flight is successful or not. You have to be in sync with your GPS and be ready to change its route or waypoint in a few seconds with one hand while the plane is bouncing. This chart does not cover all the features of any of the units but does cover the ones I think are critical. Click on chart to expand. Back arrow to go back.